One of our most popular products in the Tenura range is the Anti –Slip Aqua Safe bath strips and discs. These products are a very simple, very subtle and a very effective solution for helping the prevention of slips and falls in baths, showers and wet rooms. The surface of the product is designed to have exceptional grip when the product is wet but also to not be too abrasive on bare skin and cause skin irritation. The design also makes the product very easy to clean and will not harbor bacteria. This makes them far more effective than rubber bath mats. One thing I would like to touch on in this Blog is the correct application method for applying the Aqua Safe stickers, due to questions raised by customers, on a weekly basis. The adhesive sticker on the back of the product will only stick to a completely dry surface. Otherwise the stickers will peel up after a couple of rinses. We suggest wiping the shower surface down with an alcohol based cleaner to remove any moisture or residue that may be on the bottom of the tray. We only recommend alcohol based cleaners, as using cream based cleaners leave a residue which will contaminate the adhesive, causing it to fail. A couple months ago we provided sample packs of Tenura products to different Occupational Therapists around the country. We wanted to get an honest opinion of our products from professionals. The feedback we received has been great and a lot of the Occupational Therapists who received sample packs and have spoken to at exhibitions now recommend Tenura products to their clients. Recently we have received photographs from the Merlin Centre in Cornwall. Their experts provide a range of care, support and therapies to improve the lives of people with Multiple Sclerosis and other neurological conditions. Not only do they help the individuals effected, but they help their families and the people who care for them too. The people there have been finding new ways to use Tenura at the day centre. 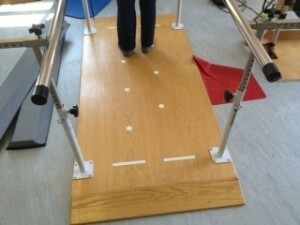 One of the exercises they have been doing helps rehabilitate people to allow them to walk freely again. This has included the application of our Aqua Safe, anti slip stickers on a wooden walk way. This not only aids grip, but assists with co-ordination too, as the contrast of the white stickers on brown wooden flooring makes a clear visual target for people to place their feet. This is not the only exercise being implemented at the Merlin Centre that features Tenura products, but we hope to embellish on those in another blog post. If you have any interesting ways of using our bathroom stickers, aside from their intended use, please let us know, we would love to hear from you. Posted in Assisted Living, Daily Living Aids, Independent Living, Tenura Updates and tagged anti slip discs, anti slip strips, aqua safe discs, aqua safe stickers, aqua safe strips on 22nd October 2013 .